After Russia's annexation of Crimea in March 2014, Western powers and their allies responded by imposing sanctions on key sectors of the Russian economy. 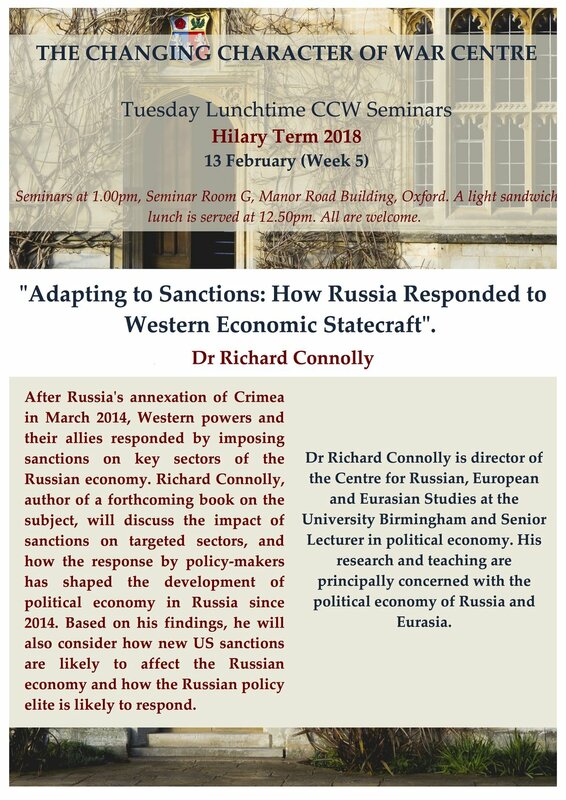 Richard Connolly, author of a forthcoming book on the subject, will discuss the impact of sanctions on targeted sectors, and how the response by policy-makers has shaped the development of political economy in Russia since 2014. Based on his findings, he will also consider how new US sanctions are likely to affect the Russian economy and how the Russian policy elite is likely to respond. Dr Richard Connolly is director of the Centre for Russian, European and Eurasian Studies at the University Birmingham and Senior Lecturer in political economy. His research and teaching are principally concerned with the political economy of Russia and Eurasia.